In 2006, Irish writer-director John Carney had an indie hit with his shoestring budget musical Once. The film, about a romance between a Dublin busker and a Czech flower seller who are brought together by their passion for music, won an Oscar for Best Original Song and spawned a Tony Award winning Broadway musical. 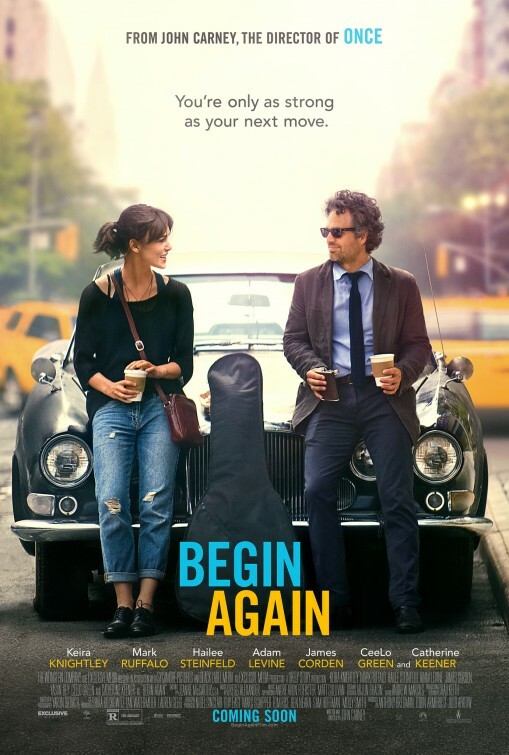 Carney returns to familiar territory with Begin Again. Originally titled ‘Can a Song Save Your Life?’, the film explores the redemptive power of music and creative collaboration. In a New York bar a young woman is invited up on stage to sing one of her songs and is almost completely ignored except for one man who stands transfixed. We rewind to approach the scene from two different perspectives; first his, then hers. He is Dan, a music producer who has hit rock bottom. His marriage has broken up, his daughter doesn’t respect him and he has just been fired from the record company he founded. She is Greta, recently broken up from her long-time boyfriend and song-writing partner after he hits the big time and is corrupted by fame. Dan hears something in Greta’s music that lights a fire in him and convinces her to record an album. Without access to a studio Dan and Greta decide they will make the album an ode to New York, and set about recording tracks live in different locations around the city, incorporating the ambient sounds of the town into their music. While very derivative of Once, Begin Again is a glossier, more Hollywood movie with a bigger cast and bigger stars. Despite this, it manages to retain the sincerity of the earlier film thanks largely to strong performances from Keira Knightley and Mark Ruffalo. The two share great chemistry, but Carney thankfully resisting the urge to slip into cliché and keeps their relationship platonic. While that these two can act should be no surprise, that Knightley can sing might be. She does all her own singing, and while she doesn’t have a big voice, it is an emotive one. These two are surrounded by a quality supporting cast including Hailee Steinfeld, Catherine Keener and Maroon 5’s Adam Levine. It is James Corden though who steals the show as Greta’s old friend and the film’s chief comic relief. While not a musical, music is obviously of central importance to the story. For these characters music is their life, and the film has some really clever ways of demonstrating the importance of music to them. There is one magical scene in which we see Greta’s initial bar performance from Dan’s perspective. As Dan’s imagination flies away arranging this song we see different instruments – a piano, drums, strings – start to play themselves accompanying the lone guitarist. With music being so central to the story, it is supremely important that Carney and his team got the songs right. Fortunately, the film’s songs, primarily written by former New Radicals front man Gregg Alexander, are among its strongest attributes. However, there is a slight inauthenticity in the filmmakers’ unwillingness to back the premise of the album they are recording. We watch these live street recordings taking place but it is all too obvious that we are hearing studio mastered audio. Begin Again is not as artistically aspirational as its characters are. It prefers to engage in some mainstream Hollywood feel-goodery. But the fact that this film remains upbeat, never wallowing even as the characters go through some low times, makes it a very hard film not to enjoy. Have you seen Begin Again? Leave a comment and let us know what you thought.